This month's event is being hosted by Blair over on his blog Trader Tiki's Booze Blog. The theme is simply Rum!. If you would like to participate, please write up a cocktail in this topic before Monday, May 12th at midnight. I will compile a list of cocktails posted and email them to the organizer. Shake, strain into a cocktail glass, and float a bit of Lemon Hart 151 if you're feeling whiskery. Shake, strain into a cocktail glass, and flame a thick disk of grapefruit over the top. Shake, strain into a highball glass or tall tiki mug with fresh crushed ice, serve with a straw. Shake, strain into a cocktail glass. Shake, strain into a tiki mug with fresh crushed ice, and garnish if you're in the mood. Wow Chris, that's quite the Lion's share of recipes there. I'll have to try them out before Monday! I write to add that a dash of Angostura (or, if you've got 'em, the barrel-aged bitters from Fee's) is a fine addition to that Mai Tai above. Also, to ask: where are the rest of y'all? I think I might have mentioned this a while back, but here's a little something I came up with to entertain myself and a couple of late night bar guests. Stir/strain/up: I think I garnished this with orange zest, but I don't quite recall. It's decent but not earth-shattering. The most notable thing about it is that at least when made exactly as above, the pattern on the palate creates, for lack of better word, a hole where the flavor of white chocolate would be, sort of like a negative image. It sounds weird and it's kind of an inadequate description but I'd never experienced something like that before and don't know how else to say it. I'd say it's probably worth trying once. Some friends asked me to come up with a cocktail for a collaborative zine project they are working on. The zine is based around a group of wood cuts and illustrations by one of the artists. Crab malice. An angry crab on rocks in a glass. The cocktail of choice for a certain octopus who lives in the waters near Alcatraz. The octopus is in love with a swimmer. They can never be together for obvious reasons. oh yeah, as in the past and as it will probably be in the future, parts of the city are underwater. A bittersweet and whimsical love triangle. This one stumped me for quite a while. For obvious reasons I thought it should be bitter, but wasn't sure what to use for a base spirit. The deadline for the project actually passed. But a note of salvation! The deadline had been extended! 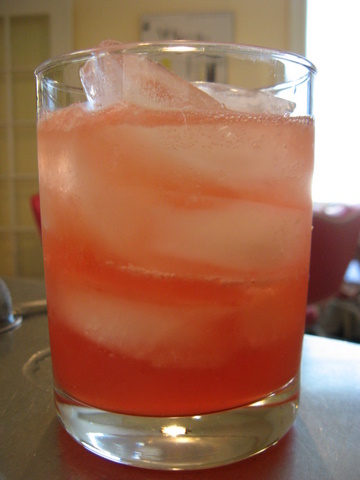 Then yesterday, uh duh, Campari occurred to me. Sheesh! Red like a crab! Shake with ice and strain into an ice filled glass. Top with soda water or selzer. edit - The only cocktail that I sort of had in mind when making this was the Jasmine. Similar ingredients, but inverted proportions to make up for using selzer and rocks. Aside from the Americano, is there anything else it is similar to? What cocktails are tippled deep under the sea? With bitters and bubbles as fresh as can be? What rum is that, Erik? Wow, fantastic! A theme song! I was using Flor de Cana's Extra Dry to preserve the red color. I actually think it might be a bit better with more of a character rum. nice entry. I'm curious about the rums you suggest. For the east side of Africa Rum, are you suggesting Starr? I keep seeing bottles of it on the liquor store, I'm curious now if it's worth a try. And Santa Catalina Islands... drawing a blank there. Research suggests some Dominican Rums (Santa Catalina Island), Brugal, Bermudez, neither of which have I taken the opportunity to try. Congratulations, you've piqued my curiosity. * 35 ml Havana Club 3 years (or Appleton White rum). Shake, strain and serve over a mountain of crushed ice lightly dusted with Madagascar vanilla powder. Garnish with a pineapple leaf. By "Roast Paprika Syrup", do you mean what we in the US would call roasted "red bell pepper"? Or do you mean actual dried paprika? If so, how to prepare either? Take 1/3 of a red paprika and 1/3 of a green and roast/grill them in the owen until the surface gets blackened. Let cool and take off most of the skin but leave just a little on. Make a 2:1 simple with white sugar to 1L water and add the paprika and some lemon zest and simmer until the sugar has dissolved. Add a little JW&N overproof rum, let cool and strain. This syrup gets a lovely paprika lemony flavor. For those interested parties, the wrap-up has been posted. Oh, cool! I just got to try the Armazem Vieira Esmerelda out at the bar the other day. It's just starting to show up out here in bars and liquor stores. Couldn't resist picking up a bottle, it's such a unique and interesting taste. Isn't La República de Cabo Verde a Macaronesian archipelago off the West side of Africa? Armazem Vieira Esmeralda comes from Florianópolis, the capital city of the State of Santa Catarina in Southern Brazil. Specifically, from the barrio of Saco dos Limões on the island of Santa Catarina -- which is about as much of an island as Long Island.